There’s a NEW TRACK AVAILABLE NOW on the Pledge page, but ONLY FOR YOU PLEDGESTERS. So go have a look and get involved if you haven’t already! Not only are you taking the power back from The Man, but your money is going directly towards funding our third and best album. Plus 10% of all proceeds go directly to our friend Tim Smith (Cardiacs), who remains in constant rehabilitation for brain injuries sustained when he suffered a combined heart attack and stroke. 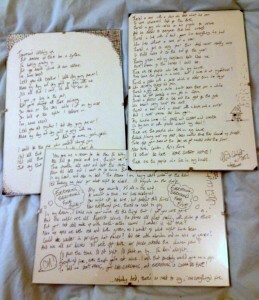 There’s a COMPLETELY NEW PLEDGE now up, for the Christmas card/EM ‘Best Of So Far’ CD for your pals. More details on the Pledge site again, and below in the previous news item. They’re only £10 (UK) and you can buy as many as you want. These are to spread the word, and to fill the stockings of your nearest and, occasionally, dearest. 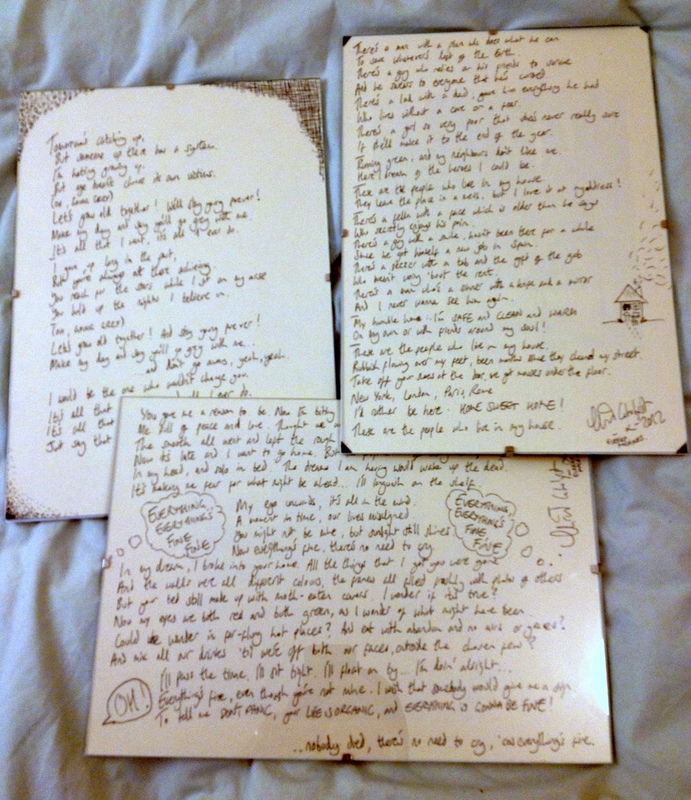 Also Chris has been beavering away on the handwritten lyrics this past few days. Every one is completely bespoke, written with a fancy fountain pen and framed, with different drawings and doodles. Each one ordered before December 17th will arrive in time for Christmas. A great gift for the more ardent supporter. Again, go to the Pledge site to have a look. This entry was posted in News, PledgeMusic by webmaster. Bookmark the permalink.